During a recent clear-out of years of accumulated junk, I came across this photo which puzzles me. It obviously shows a line-up of United Autos buses (more details requested please), circa 1930, but here's the puzzle. On the reverse is a rubber stamped imprint "W Speight, Keighley". Why would a Keighley photographer be in United territory, or (more likely) why were these United buses in Keighley? There is a tram track in the foreground but I can't pin down a Keighley location to match the track and imposing building. Just to add to the confusion. These vehicles may well have been acquired by United as the result of a takeover. I don't know when the practice of centralisation started, but as far as I'm aware all new United buses were HN Darlington registrations, and these are EF which is Hartlepool. These appear to be a Thornycroft model known as the BC Forward, which dated from 1927 and was probably Thornycroft's most successful bus chassis. The manufacturer changed the shape of the radiator towards the end of 1929, so the vehicles shown must date from 1929 or earlier. The engine was a 6.9 litre side valve petrol unit of 82 bhp. The bodies could well be Hall Lewis 32 seaters. 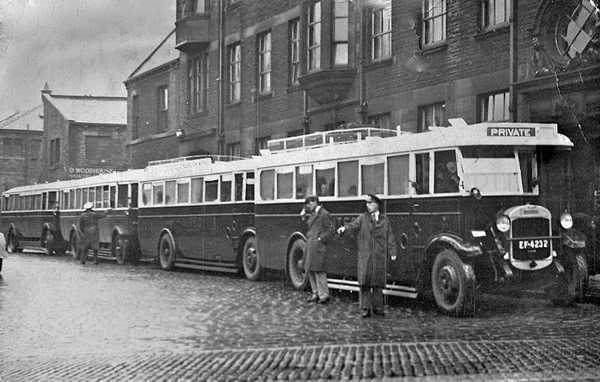 The railway companies, including the LNER, bought quite a number of these buses, which could explain the inclusion of this type in the United fleet. It will be noticed that the third and fourth vehicles are distinctly not the same model as the first two. The LNER took a share in Eastern Express Motors of West Hartlepool in August 1928. Amongst their bus purchases in 1929 were two Thornycroft BC with Vickers B32F bodies. Numbered 56 and 57 (EF 4231/2) they were first licensed on 23rd July 1929 and allocated to Eastern Express. However, in that month the LNER had purchased a share in United and as a consequence these buses were soon transferred to the United fleet as seen in the photo. This doesn't explain the reason they're in Keighley. I've had a good fly around a contemporary (1928) Keighley courtesy of the Britainfromabove website but haven't found a building matching that fairly distinctive one behind the buses. A nice neat line up Paul, but as you say, the backdrop is a real puzzle. Following a few sorties onto various Keighley websites, I wondered if the photo could have been taken at the rear of the Keighley Hippodrome (later the Queen's Theatre). I do not remember this large building at all, but it stood at the bottom end of Keighley bus station until at least the mid 'fifties. It was demolished to make way for a multi-storey car park (fronted by Hanover Street), which still stands on the site. Although Keighley Corporation did operate trams until the mid 'twenties, could the line across the foreground actually be the edge of one road cutting across another, rather than a tram track? This may account for the differing angles of the stone setts at the junction (Hanover Street and Cavendish Street for example?). If the building in the photo is the Hippodrome, this may help explain a reason for the private hire. On another track (no pun intended), although the postcard bears the legend 'W. Speight Keighley', was the photo actually taken in the town? It does look like an industrial setting, but the architecture, despite having several interesting features, could also be in any neighbouring town or city. My comments are all speculative I'm afraid, but hopefully of interest. As the saying goes, "the plot thickens!!" Many thanks Ronnie, Roger, Stephen and Brendan. Very informative. I think you may be correct, Brendan. This could indeed be the rear of the old Hippodrome, on what is now Hanover Street. I cropped the original photo to obliterate some blemishes, and there are indeed tram tracks in the foreground. This makes sense as being at right angles to East Parade. Obviously the trams would have gone by the time of this photo but the tracks would have remained in the cobbled setts for some time after. Still slightly puzzled about the United buses in Keighley. Maybe a visiting choir or brass band? I will endeavour to get a definite fix on the location for you by sending a copy of the photograph to a well known Keighley Local Historian Ian Dewhirst. As promised I duly sent a copy of the photograph to Ian Dewhirst, an acknowledged expert on Keighley history. "In answer to your letter I have to say that I don't think that the photograph was taken in Keighley at all. The location is certainly not at the former Hippodrome, and I cannot remember ever having seen a Keighley photograph, past or present, to include the prominent building filling most of the background. With those fancy jutting-out windows and the ornamental circular window on the far right, this is or was a quite prestigious building wherever it was; but I can't place it in Keighley. William Speight, who died about 1960, was a well known Keighley photographer who supplied newspapers as a freelance. Whilst he certainly acted a good deal on behalf of the 'Keighley News', he also supplied photographs to other West Riding newspapers, so this one doesn't have to be Keighley. I wouldn't be sure that is a tram track in the foreground; it looks more like a change from one sort of setts to another. If it were to be a tram track it would rule out Keighley as a location, as Keighley's trams were discontinued in 1924, whereas I'm sure this photograph is later." Many thanks, Gordon, for putting the puzzle to Ian Dewhirst - a fount of Keighley knowledge. Frustrating as it is, I must bow to Ian's conclusion that the photo is not in Keighley - but where?? Ian's statement that the photographer was freelance opens the door to other locations in the region. I'm sure I'm not alone in recognising the style of building but can't for the life of me think where it could be. The mystery remains unsolved....unless someone knows different? I can see some lettering on the next building along. Is this any clearer on the original? Could it tell us anything? I have tried Keighley historical directories to no avail! It's Wilton Street in Bradford. I only know this because I've been following the same picture / thread at www.sct61.org.uk where it's been solved. Thank you Ken for that bit of super-sleuthing and well done indeed. I must have passed that building many times in my younger days, but did not connect it at all with the photo. Delving on the internet, it transpires that the large Edwardian building - which still stands - was formerly the Edmund Street Clinic, standing as it does on the corner of Wilton Street and Morley Street. (Edmund Street runs behind the building, parallel to Wilton Street). It is within the 'Little Horton Lane Conservation Area' but is not as yet a listed building. As Ken states, the buses are parked on Wilton Street, but why they are there is still a puzzle, although two 'large crowd' venues spring to mind. The nearest, literally just around the corner, is the Bradford Alhambra theatre, but would a show or concert there warrant quite so many visitors from the north-east? My second thought was of Bradford Park Avenue Football Club, as its ground was just up the road on Horton Park Avenue. Delving on the web again, it appears that when the club was in the third division it played at home to clubs such as Durham City, Ashington, Hartlepools United and Darlington - all in United Auto territory. However, going on David B's comments re the Thornycrofts dating from 1929, by then Park Avenue were in the second division, and the only north-eastern club they played against at home was Newcastle United - again based in United Auto territory. However, Park Avenue only played at home to Newcastle on 30.1.35, 28.12.35, 14.9.36, 5.3.38 and 4.3.39 according to the records browsed. This would make the Thornycrofts between six and nine years old, but maybe an important match could account for the number of vehicles in the line-up. Although this poses a few more questions, I hope the information may be of interest. Please excuse me now while I go lie down in a darkened room to eat some chocolate, as I'm not really a fan of football and my head hurts! Brendan - I think the Alhambra is the more likely. Your research into the Bradford Park Avenue fixture list is impressive BUT Horton Park Avenue is (and I think was at the time) a wide and straight thoroughfare approximately half a mile long with adequate parking immediately outside the combined football and cricket grounds. Bradford Corporation buses could be seen lined up there and indeed when the Wibsey and Buttershaw routes were converted to trolleybus operation in the mid 1950's a branch was wired as far as the Park Gates and the football and cricket specials were operated by trolleybuses. And finally there was even a railway station - Horton Park (adjacent to the Sports Grounds) on the Great Northern 'Alpine' Bradford-Queensbury- Keighley/Halifax line which was closed (before the line) in the early 1950's. Thanks for the information Gordon. It's amazing that there was a station for the football ground, and the thought of all those Bradford trolleybuses lined up as well would have made match days a real magnet for local transport enthusiasts, whether they followed football or not. On the subject of the Alhambra Theatre, it is possible that the United buses had brought people to that venue from the north east, as you say, given that the Alhambra has attracted many big stars over the years. It's all fascinating stuff isn't it? You have struck a note there Brendan. Horton Park Avenue was, indeed, a magnet for trolleybus (and tram) photography in Bradford as several "classic" views show. There was also a County cricket ground at "The Avenue", and sufficient parking space for visiting coaches, but as a "City" fan, I prefer not to dwell too long on "Avenue" related subjects! Glad however,that we have finally placed the Thornycroft. I should have recognised it earlier, with that well known watering hole , the "Mannville" just around the corner, near to the old "Tech" college! What a characterful city Bradford was! The discussion at http://www.sct61.org.uk/ua57 has suggested that if these buses were taking people to the Alhambra then the vehicles are there as an overspill from Chester Street. Another comment makes the point that the vehicles may not have come from the North East as United had garages at Ripon and Scarborough at the time the picture was taken. The discussion has now moved away from the buses to the man with something in his hand. The gable ended building behind the buses is now the Rahwal Asian restaurant. The photographer is stood in front of what is now the Kashmir Asian Restaurant which has been feeding students and other discerning customers for over 40 years. The street also played host to the city's public mortuary until the end of the twentieth century. In addition to the Alhambra there was also in the vicinity the The Princes Theatre which was situated in the area in front of the National Media Museum building This closed in the 1961 Again it is but a short walk from Wilton Street. In 1936 the Independent Labour Party held their annual conference in Keighley now this is pure conjecture on my part could this be a day trip form the conference to see the birthplace of the party in Bradford!